A light touch that “makes pores vanish”. Powder Foundation to achieve pure soft skin. Soft and sleek, the ﬁrst* lightness of its kind. Creates poreless, pure skin that lasts all day long. Melts gently onto skin, and is so comfortable it feels barely there. Covers pores and uneven color, for skin with soft texture that lasts. “Smooth-soft Cushion Ingredient” adheres softly onto skin and seals to boost makeup hold. 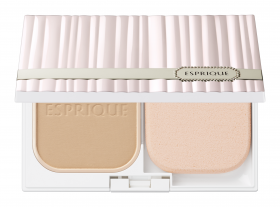 “Pure Skin Cover Powder” has a soft-focus effect on pores, achieving a coverage effect that looks like bare skin. “Blend & Bond Complex” blends into skin to achieve a ﬁnish with no dryness, and also works with sebum to boost bonding power, preventing makeup breakdown due to shine. “Pore Care Ingredient” smoothly covers unevenness by matching the size of pores. SPF26 / PA++ Blocks UV rays and prevents dark spots and freckles due to the sun. Use after preparing skin with makeup base. Take a small amount onto either a dry sponge or wet sponge that has been thoroughly wrung out, and apply to skin taking care not to miss any areas.